This past weekend, Snowbird hosted the final South Series Qualifier for the Intermountain Division of youth alpine ski racing. 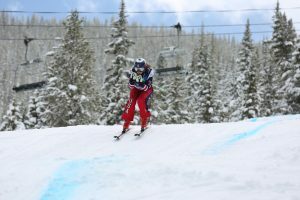 The format was giant slalom (GS) on Saturday and slalom (SL) on Sunday; each skier takes two runs for a combined time. Nearly 300 skiers from all over Utah as well as Colorado tackled the courses. With nine new inches of fresh powder overnight, the races got started shortly after 9:30 a.m. on Saturday. In the under-10 girls’ category, there were 33 competitors. Elisabeth Bocock of Snowbird earned the top spot on the podium followed by Summit Ski Team’s Wynter Probert in second. Park City Ski Team’s Greta Goldsmith captured fourth. With over 60 racers in the U12 girls’ division, Dasha Romanov of Front Range Ski Club out of Colorado took first. It was PCST’s Lauren Stemler who earned third and Mia Hunt fourth. Other top-10 PCST finishes included M. Luna (sixth), M. Quinlan (seventh) and A. Gorsch (ninth). For the U14 girls, it was Anya Biskupiak of Snowbird on top, followed by PCST’s Lexi Laufer in second. The U10 boys’ GS race was won by Nathan O’Reilly of Snowbird. 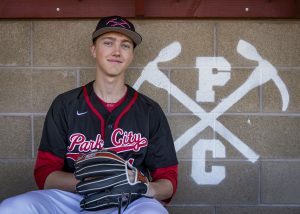 Daniel Macuga of the PCST earned second, followed by Park City Farm Team’s Austin Aten in fourth. Jonathan Brain of PCST captured the last podium spot in fifth. The nearly 90 racers in the U12 boys’ division battled variable conditions in the GS race on Saturday. Nicko Palamaras of Vail put together two great runs to capture the first spot. PCST teammates Justin Bigatel and Gunnar Travis tied for second. Other top-10 finishes by PCST skiers included B. Milner (sixth), J. Pollard (seventh), and L. Garces (ninth). For the U14+ boys division, Andrei Dan of Snowbird took the top spot. With winter-like temperatures and sunny skies, the alpine ski races took to the slopes to see who would be crowned the fastest slalom skier of the day. Phoebe Heaydon of Vail took the top podium spot for the U10 girls. Wynter Probert of SST earned third and PCST’s Greta Goldsmith captured fifth. For the U12 girls, it was a repeat for Dasha Romanov of Vail, skiing to first two days in a row. Mia Hunt of the PCST put together two fast runs to earn third. Other top-10 finishes for the PCST included M. Quinlan (seventh) and M. Luna (ninth). It was another repeat for the U14 girls, with Anya Biskupiak of Snowbird taking first place. Anna Grossniklaus and Cheyenne Gawreluk, both from PCST, earned third and fifth, respectively. On the stubby course, the U10 boys battled, with Connor Stone of Brighton taking first. Jeremy Nolting of the PCST skied to third and Micah Sheinberg of SST took fourth. For the U12 boys, it was another repeat from Vail’s Nicko Palamaras, who took first. PCST’s Justin Bigatel earned second. PCST’s Jack Pollard put together two solid runs to capture third, followed by teammate Leyton Sheppard in fourth. Other top-10 U12 boys’ finishes included T. Polster (sixth) and G. Travis (eighth). It was James Bocock who skied to first place for the U14 boys on his home hill. The Intermountain Championship races will be held at Canyons Resort March 13-15. For both girls and boys, the top 35 U12 and top 15 U10 racers based upon their season performance will be selected to attend the championship.